That's right, the one with the lot! Most awesome beach skydive in Australia with the ultimate media package possible. You got it all. The one with the lot. In a world gone mad, come skydive with us to find your freedom. This tandem beach skydive is up to 15,000ft with a maximum of 70 seconds of freefall. The average duration for the entire process is 2 hrs. Use the form below to select a date and time. Comfortable casual dress, enclosed shoes. Skydive apparel provided. Family & friends are very welcome to watch. Your cheer squad can even see you exit the aircraft! Your media will be edited to view and take home. Coffs Harbour has a great year round climate. Skydiving is a weather dependent sport. We do not jump in unsafe weather conditions which includes rain or strong winds. 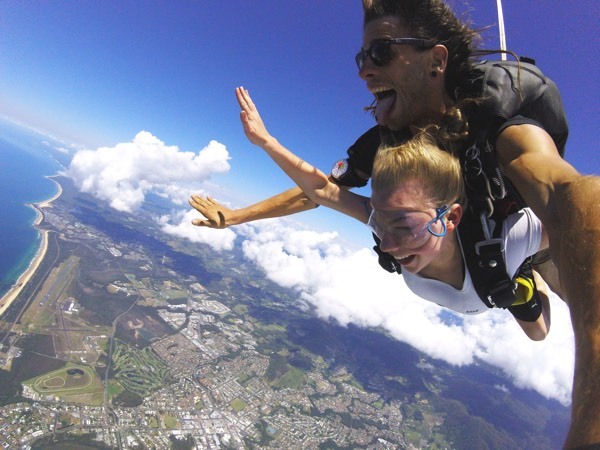 Thank you for choosing Coffs Skydivers to experience the freedom of skydiving.